The splenius, shown in red. The splenius has a continuous origin from the lower half of the ligamentum nuchae, and from the spines of the seventh cervical and upper six thoracic vertebrae. Its fibers pass obliquely upwards and laterally, forming a thick, flat muscle which soon divides into a cervical and cranial portion, termed respectively and splenius cervicis and the splenius capitis. 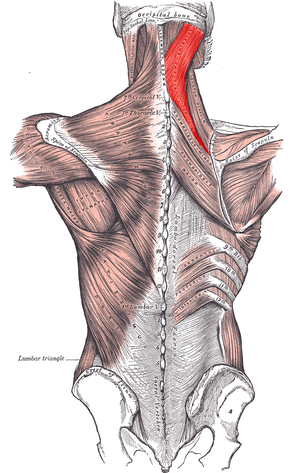 The splenius cervicis curves forwards and is inserted, by tendinous slips, into the transverse processes of the upper two or three cervical vertebrae behind the levator scapulae, which overlaps it and excludes it from the floor of the posterior triangle. The splenius capitis passes under cover of the upper part of the sterno-mastoid muscle, and gains insertion into the lower part of the mastoid process of the temporal bone and into the lateral portion of the superior nuchal line. The splenius bends the head and neck backwards and turns them towards its own side. It is supplied by the posterior primary rami of the cervical nerves, and is pierced by their cutaneous branches.